Spring. A time when Nature throws back her cold, freezing blanket of frost, ice and snow. A time when new life springs forth. When the days grow longer and the nights feel more welcome. The dreary grey of winter is replaced by the warmth of colour. When lush green meadows are awash with the colour of flowers sparkling in the golden sun. 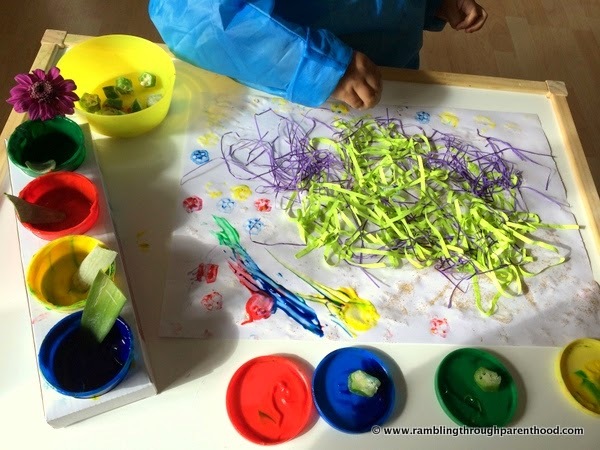 It is this picture of a meadow of spring flowers that my nearly-3 year old son and I decided to paint for this month's Center Parcs challenge. 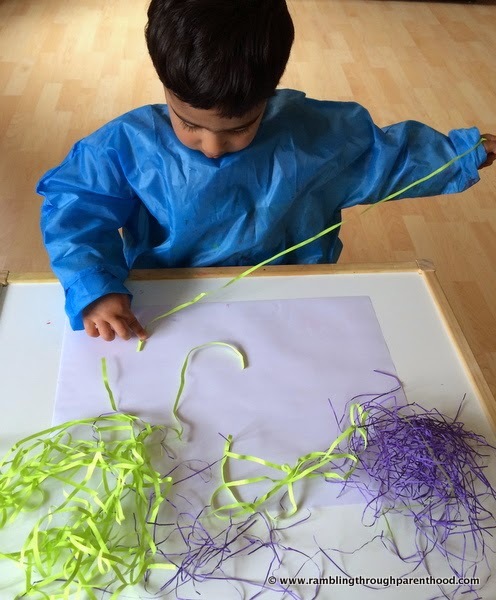 "Find materials around the house to add to the painting, giving it a 3D effect. Why not paint an old bottle cap and stick it in the centre of a flower, really bringing your painting to life?" 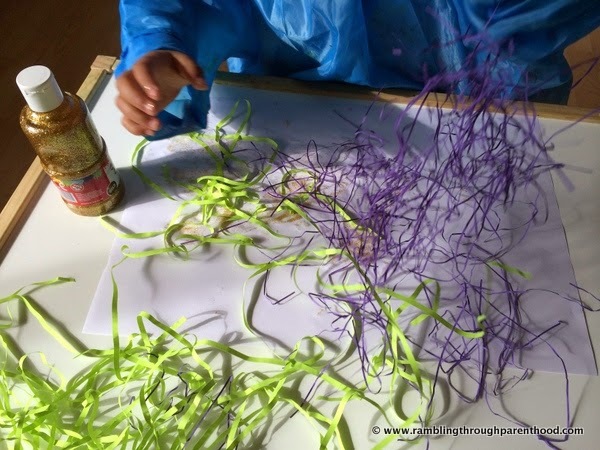 We started with some golden glitter glue to capture the essence of golden sunshine on a spring day. J, my little boy, insisted on squeezing out the glue all by his own self. So we had big blobs of gold on our paper, which J proceeded to spread all over with his fingers. And ended up with sparkly gold fingers in the process. We had some packing material, I think it is wood wool, lying about the house. It was green and purple and would do very well for our spring meadow. J got busy pulling at tufts of green and purple and sticking them on the glitter glue. He thumped it all in place to make sure it got stuck quite firmly. Then we brought out his pots of finger paint. Instead of using his little fingers to dab on the paint, I gave him a few leaves cut off from a pineapple sitting on my kitchen counter. I did make sure the sharp thorny bits were well trimmed before J got his hands on them. 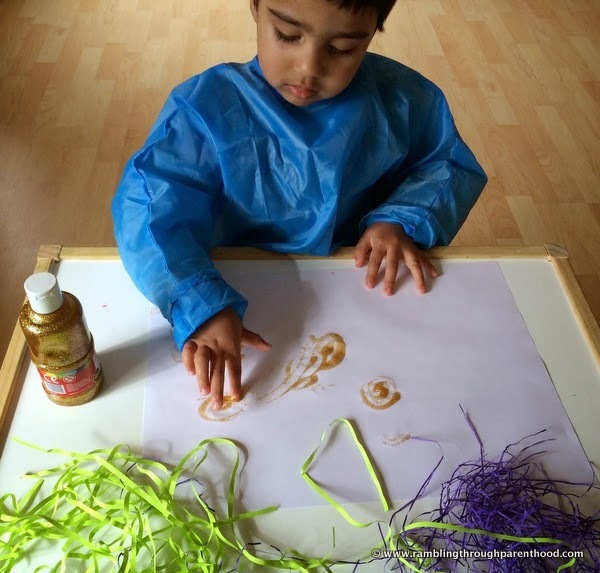 He had a blast dipping the leaves in the paint and using them as a brush to do his painting. It was more a matter of scooping out the paint, plopping it on the paper and then smudging it around. We used chopped up pieces of okra to print the flowers in our spring meadow. Okra (bhindi or ladies' fingers) is a green vegetable which when cut, yields pentagon-shaped pieces that make rather pretty flowers. So all J had to do was pick up a piece of okra, dab it in some colour and stamp it all across the paper. With a little help from his Mother. He is only nearly-3 after all! 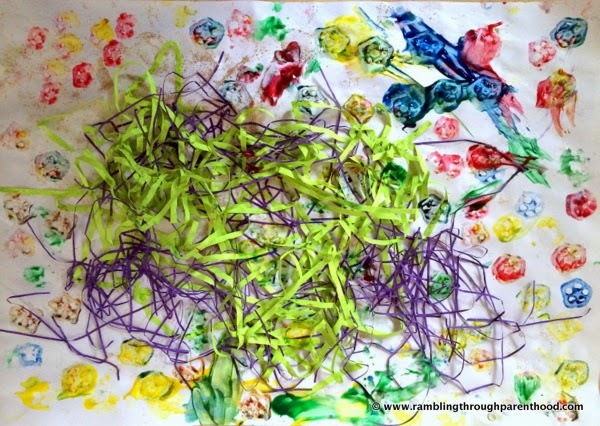 End-result, a very impressive artistic take on a sunlit meadow of spring flowers. Almost impressionist, I think. This is my entry to the Center Parcs and Tots 100 March challenge. If I’m chosen, I would like to visit Sherwood Forest. It looks like he had a lot of fun! What a great picture. You have a very creative boy there! My youngest still isn't keen on getting messy and the big on frequently gets bored half way through! I love the end result. A lovely picture, you son is very artistic. Good luck in the competition! 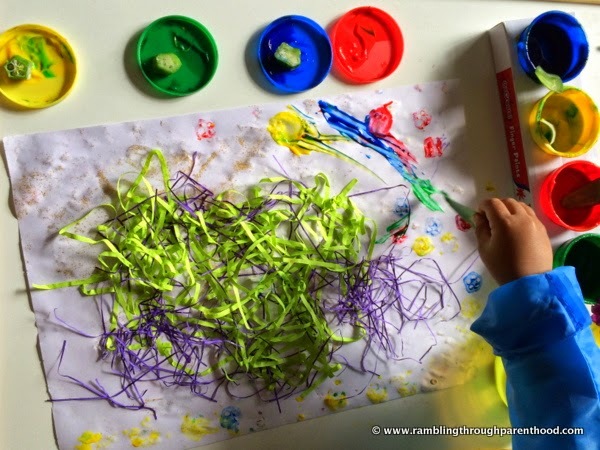 I just adore this picture - it looks like lots of fun with a toddler but it truly is a lovely piece of artwork - the colours really capture the essence of spring! What a gorgeous picture - very creative. I particularly like the use of the okra. Good luck! I love this, love the okra flowers and all the colours, lovely! This is a great picture - I wish my packages came with packing material like that - how beautiful! Hadn't thought of using okra for printing - must be done now! 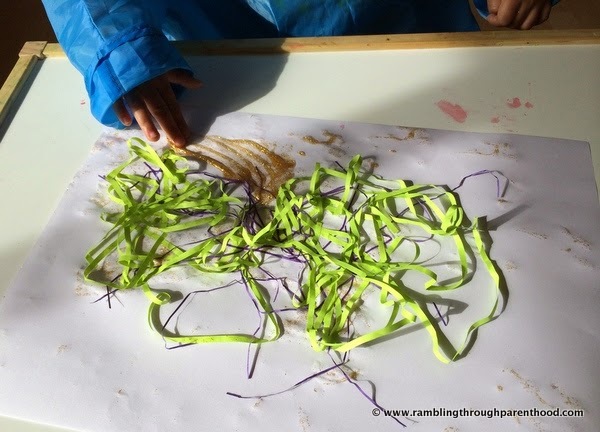 What a great 'making' activity - really creative and the end result is fab too. I love the idea of printing flowers with the okra. Good luck, your son is very artistic, Oscar would lose patience halfway through.